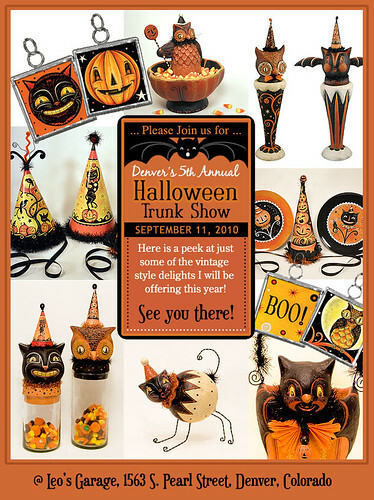 Just a reminder that this Saturday is Denver's 5th Annual Halloween Trunk Show! This free event starts at noon, so you can sleep in! But, don't be too late as you'll have more Halloween delights to choose from if you come when the doors open. I have lots more Halloween reproduction products before than ever, so I have been busy sifting through all the goodies, making displays and preparing for the big day. The graphic above is a fun collage of just some of those items I will be offering. Give it a click for a closer peek! And luckily, I just finished my collection of originals for this event thank goodness! You can visit my Blog Post from last year's Trunk Show Event to catch a glimpse of this festive harvest scene!